4 Bedroom Detached House For Sale in Heathfield for Guide Price £750,000. 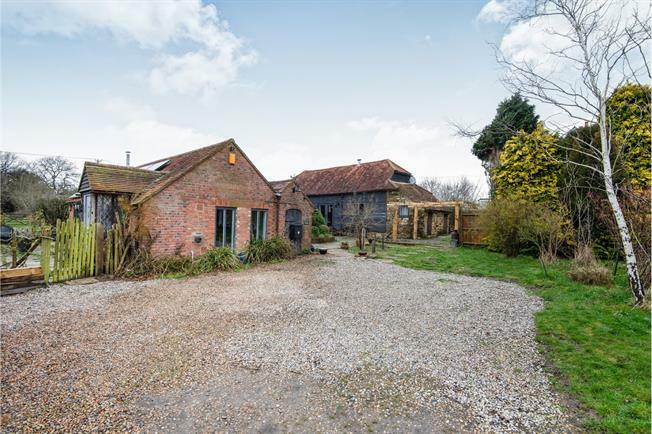 A rare opportunity to acquire this wonderful barn conversion, offering three double bedrooms and two reception rooms in the main house, a generous farmhouse style kitchen with separate utility room and two bathrooms - one of which a recently fitted, luxurious en suite. A self contained annexe on the North side of the property features an impressive open plan kitchen and reception area with a handsome fireplace, leading through to a large bedroom with en suite bathroom and dressing room. The property surrounds a central courtyard, to three sides which is accessed via an enclosed parking area suitable for several vehicles. The plot extends to just under 5 acres with gardens surrounding the property and 2 large paddocks to the North-East edge of the property. There is a large agricultural building, previously created as stables for 5 large horses but could serve a multitude of uses. Chapel Cross is a small hamlet on the outskirts of the larger market town of Heathfield, a popular location, only a short distance away from local schools and pubs. The area is well served by mainline railway stations, including Stonegate and Buxted, with regular services to and from London. The larger market town of Heathfield provides a range of shopping facilities, high street banks, building societies, public library, supermarkets, takeaways and post office. Heathfield is also served by a sixth form community college and community leisure centre. To the North is the large spa town of Royal Tunbridge Wells offering a wide range of retail facilities including Royal Victoria Shopping Centre and the famous Pantiles. To the South, the coastal resort of Eastbourne offers the Arndale Shopping Centre and various leisure activities including harbour, beaches, pier and Beachy Head..
Barn Court is a very deceptive property displaying a wealth of period charm and character and which has been imaginatively converted to now offer spacious and very flexible accommodation. The layout would suit a large family or perhaps two generations sharing and with four double bedrooms, large reception space and plenty of parking would also make a good bed and breakfast opportunity. There is planning for a twin bay garage and the footings are already in situ. In addition there is a substantial steel framed outbuilding with a secondary access and with consent for stabling and tack room if required. In semi rural surroundings offering seclusion but with the comfort of a neighbour nearby, elevated and with far reaching views and accessible to Heathfield with it's weekly market and good selection of High Street shops and facilities. The local primary school is easily accessible and Heathfield Community College is within an easy drive. ceiling timbers, 2 radiators, flank windows. WC, tiled shower cubicle with sliding doors, wash hand basin, frosted window, radiator. window to rear, radiator beneath, timbered ceiling. L shaped and with leaded light doors to rear terrace, double radiator, wall light points, TV point. fitted with a comprehensive range of base and eye level units, with complimentary granite work surfaces, twin bowl butler sink with leaded light window above, chrome swan necked mixer tap, oil fired Aga, double radiator, slate floor tiles, inset spotlights, timbered ceiling. with further range of base with complimentary work surfaces, stainless steel sink unit with window above, timbered ceiling, slate floor full width range of cupboards, one housing oil fired central heating boiler, airing cupboard with lagged tank and immersion heater, stable door to rear lobby and further stable door to rear garden. with oak door to garden, space for fridge freezer and fitted work surface. Window to rear with radiator beneath, telecom point. corner bath with tiled surround, pedestal basin, WC, frosted window, beamed ceiling, shaver light, double radiator. a superb room, heavily timbered walls and ceiling with exposed brickwork and inglenook fireplace with stone surround, bressumer beam, fitted wood burning stove on flagstone hearth, sliding double glazed doors to Inner Courtyard and full height picture windows with views over the paddocks. flank window overlooking the courtyard, heavily timbered walls and ceiling, wall light points. with access hatch to roof void, window with radiator beneath, exposed timbers. Suite of bath with coloured tiled surround, curtain and rail, pedestal basin, WC, shaver point, radiator, oak flooring. there is a further hardstanding area and detached outbuilding of steel framed construction clad in weatherboarding with sliding gale end door and side door to concrete apron, ideally suited for stabling, with power, light and water available. The remainder of the grounds are laid to grass paddocks, fence enclosed and divided by post and rail fencing, with water-trough. The far paddock slopes gently away from the property to a natural tributary, providing an ideal environment for those with equestrian interest.